From the lush wetlands of Botswana’s Okavango Delta comes the suspense-filled tale of a determined lioness ready to try anything – and willing to risk everything – to keep her family alive. Filmmakers Dereck and Beverly Joubert follow the epic journey of the lioness named Ma di Tau (“Mother of Lions”) as she battles to protect her cubs against the daunting onslaught of enemies to ensure their survival. 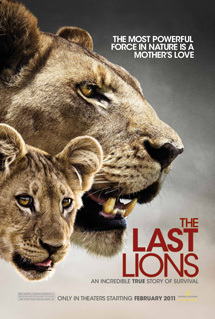 This gripping real-life saga unfolds inside a stark reality: lions are vanishing from the wild. In the last 50 years, lion populations have plummeted from 450,00 to as few as 20,000. Dereck and Beverly Joubert weave their dramatic storytelling and breathtaking, up-close footage around a resonating question: are Ma di Tau and her young to be among the last lions? Or will we as humans, having seen how tough, courageous and poignant their lives in the wild are, be moved to make a difference?